In Before Amen, Max Lucado helps you breathe in heaven and exhale God to all you meet in your daily life. With this highly-readable, highly-transformative book the well loved master storyteller shares with you the secrets of effective, life enhancing prayer. Beginning with his own honest confession - declaring himself a prayer wimp - Max admits he could pray much better. We all pray... sometimes. "On tear-stained pillows we pray. In grand liturgies we pray. At the sight of geese in flight, we pray. Quoting ancient devotions, we pray... But wouldn't we all like to pray more? Better? Deeper? Stronger? With more fire, faith, or fervency?" Before Amen is among Max Lucado’s most personal, honest and humble books to date. Anyone who wants to pray more, better and stronger, with more fire, faith and fervour will find Max’s own failures reassuring as they - like him, seek deeper connection with God through prayer. A richer prayer life is not about prayers that are better or more eloquent than others. Quite the opposite. Lucado says that humility combined with confidence provides a God-given prayer strength. If you’re never without prayer, then you’re never without hope. No one boils down spiritual truths into as concise and potent a form as Max Lucado. Join Max in 'Before Amen' as he delves into the depths of prayer to help you build a more confident platform for taking your prayer life to the next level. Before Amen by Max Lucado was published by Thomas Nelson in April 2016 and is our 8772nd best seller. The ISBN for Before Amen is 9780718078126. Be the first to review Before Amen! Got a question? No problem! Just click here to ask us about Before Amen. We all pray... some. We pray to stay sober, centered, or solvent. When the lump is deemed malignant. When the money runs out before the month does. When the marriage is falling apart. We pray. "I've waited for years for him to write on prayer and when I read 'Before Amen', it was everything I'd hoped it would be... One of my top ten reads for 2014!" - Lysa TerKeurst, author of 'Unglued'. 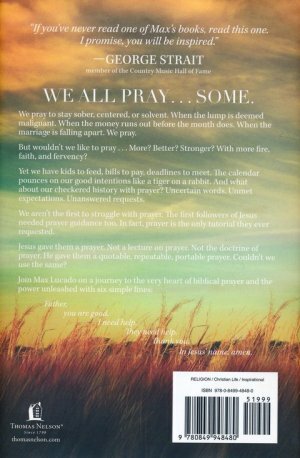 "In 'Before Amen', Max joins readers on a path towards a confident, biblically based prayer life, one line - one phrase - as a time." - Matt Batterson, author of 'The Circle Maker'. "Max on prayer! I can't think of a more inspiring author to show us how to prayer better, stronger, and with more passion." - Jack Graham, pastor of Prestonwood Baptist Church. "Experience the inspiration of vintage Lucado - the preacher-poet at his storytelling best." - Ken Shingematsu, author of 'God in my Everything'. "I set my personal best time reading 'Before Amen'. Three hours that has exploded my understanding of prayer forever!" - Matthew Crouch, Trinity Broadcasting Family of Network. Before Amen, is written for everyone who wants to pray more, better and stronger, with more fire, faith and fervency. He admits to his own failures in this area, calling himself a "recovering prayer wimp" and offering specific ways people can experience a heart connection with God through prayer. "Prayer, for most of us, is not defined by a month-long retreat, or even an hour of meditation.. a conversation with God, between appointments, while walking the hallway to class, or interacting with a client." 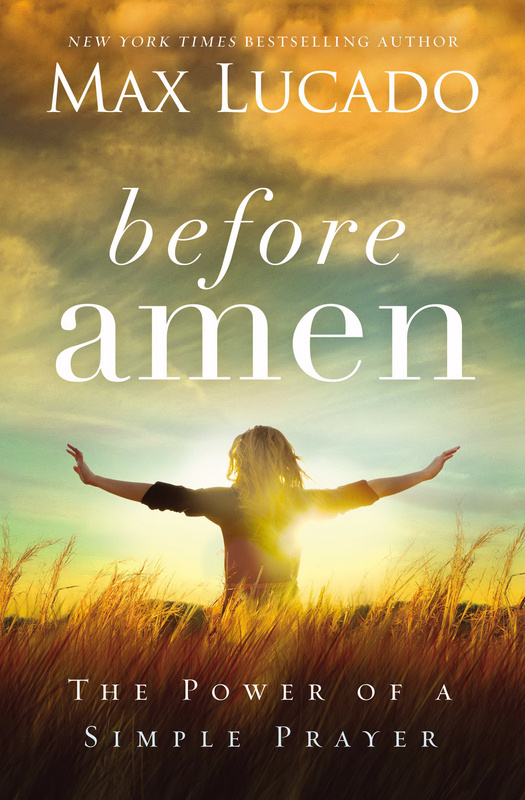 Before Amen is sprinkled with powerful stories of powerful prayers. Max also writes about some of his own doubts about prayer, sharing how to overcome disappointment from unanswered prayers and be confident that God hears. Before Amen will allow readers to calm the chaos of life by embracing a prayer life that brings peace and rest.